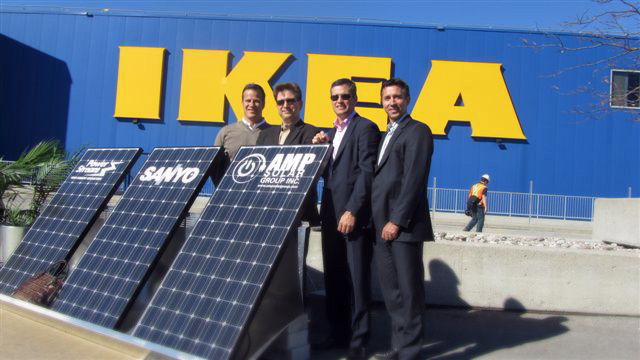 THEY MAY BE more famous for meatballs, Abba and ugly cars, but history could record the Swedes as being one of the key drivers of affordable renewable energy as Swedish flat-pack furniture retailer IKEA starts selling solar panels in its UK stores. This news is bigger than huge for several reasons. While New Zealand has the luxury of the bulk of its electricity needs being met by renewable hydro generation, many other countries have to resort to coal or oil which belches tonnes of carbon into the atmosphere, contributing to global warming and anxious environmentalists. Non-polluting technologies such as solar hold a lot of promise but have been held back by steep sticker prices. I recently investigated putting solar cells on my homes roof, but the $30,000+ price tag made it highly probable that my financial controller would finally throw her handbag at me. This is of course a real shame. If enough homes augmented their electricity consumption with solar panels, the potential spin-off benefits could be game changing. Years ago while working as a TV news reporter I did a story on a house in Auckland that’d been kitted out with solar cells. It was a pretty straightforward setup: sunlight hit the rooftop solar panels and was converted into electricity, which was stored in batteries in the basement and fed to appliances in the house after being converted to mains voltage via a power inverter. What happened in the afternoon during weekdays at this house was astonishing. When the parents were at work and kids at school, the only appliance consuming electricity was a fridge/freezer. By 1pm the batteries were fully charged and then something remarkable happened. The electricity meter ran backwards as the electricity generated by their rooftop solar cells was sent back out onto the grid. Multiplied by enough households and businesses, cities and towns could become energy producers instead of energy consumers. Don’t get me wrong. There is still going to be a need for a national electricity network, but energy generating suburbs could greatly reduce the need for another hydro dam as our population continues to grow and consume electricity. At least that’d be the case if mere mortals like you and I could afford to install them. 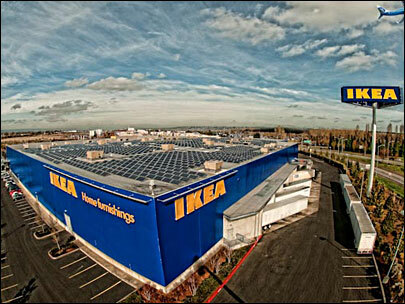 Should IKEA’s initiative be successful, chances are that they’ll begin to offer solar panels globally. This is great news as economies of scale could in theory be realised, resulting in more affordable solar panels and increased adoption by consumers. This could in turn fuel demand, spurring even more manufacturing efficiencies, creating a positive spiral of affordability. IKEA must be hoping this will be the case as it starts to sell panels made by Chinese manufacturer Hanergy in Southampton this week. If the venture proves to be a success, IKEA will roll them out across their UK stores. The starting price for a 3 kilowatt system will be a very reasonable £5700 (NZ$11,116) and that includes design and installation plus maintenance and an energy monitoring service. Given the UK’s mixed climate, IKEA estimate that a customer’s solar panel investment will pay for itself in approximately seven years. With New Zealand’s milder climate it is probable that the payback period could be even less. Perhaps the best news is that IKEA are selling a fully packaged solar system which greatly simplifies the entire undertaking. When investigating the feasibility of adding solar panels I found navigating the many specialist firms to find out what I needed to know was at best a fraught process. Solar PV will likely be installed on all houses eventually but some of the current talk re payback is unrealistic. The UK, 7 years, may include subsidies but NZ buyback rates are quite low once your limits are exceeded. Think 10-15 years at least and while the cost of panels is dropping a significant part is for electricians, electrical inspection and council. Still the most effective use of money in reducing power usage via efficiency. … and a darn sight more palatable than more dopey windfarms. surely government investment in solar technology at a homeowner level would make better economic and social sense long term than sticking with exauhstable fossil fuels like natural gas and coal. At least incentivise it or offer a similar scheme to the home insulation and heating roll out that has just finished. this invenstment would show huge benifits in the long run. and imaging the savings if even 1 in 100 houses were to be putting power back into the national grid?? i guess the short sited down side to this is, what benifit would there be for the government owned energy providers…. both fossil and hydro….